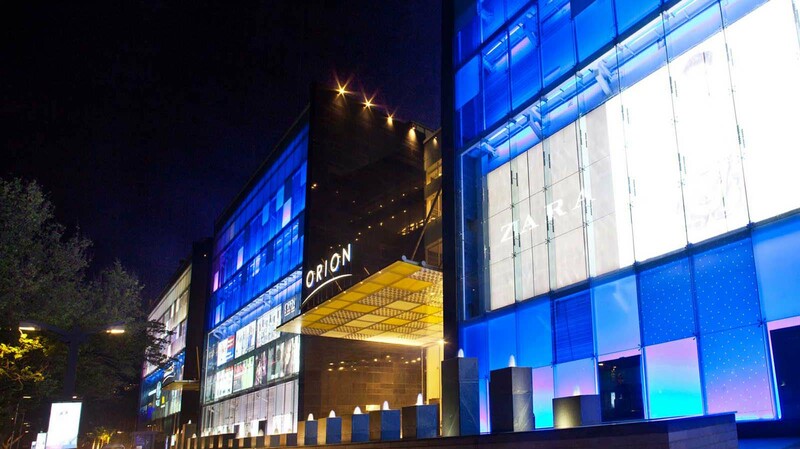 The Orion Mall is part of the 40-acre mixed-use Brigade Gateway site located at Rajajinagar-Malleswaram Junction in North Bangalore, India. 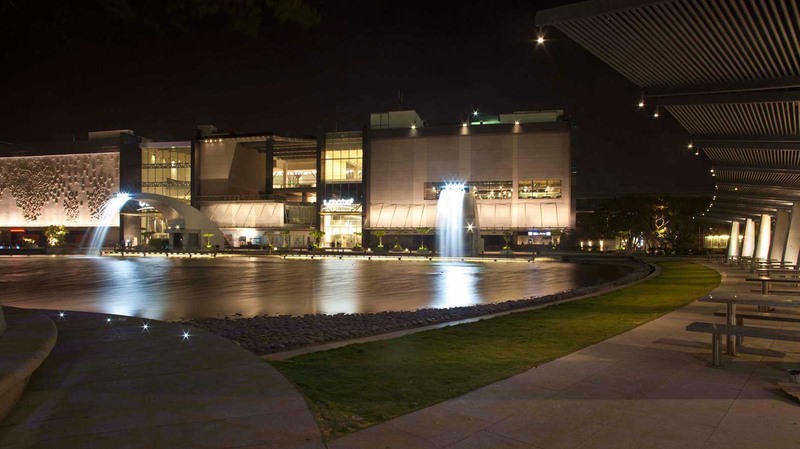 The mall totals 1.1 million square feet, is the first lifestyle mall in Bangalore, and was designed by HOK, New York. 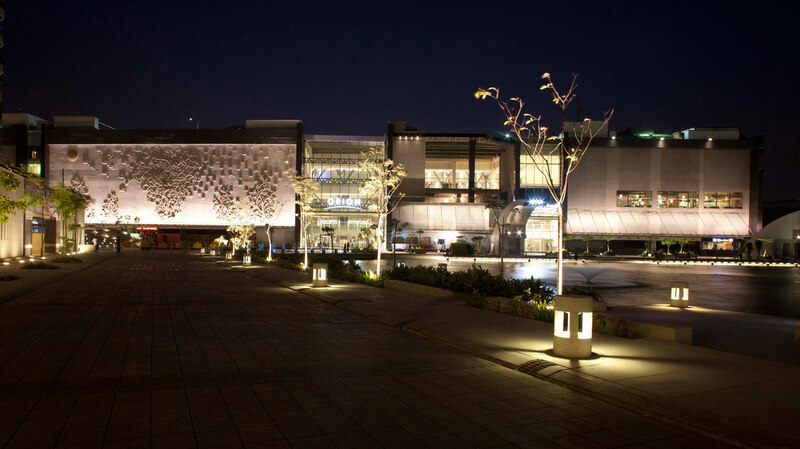 AWA designed the lighting for the Brigade Gateway complex by establishing focal points and a distinct visual hierarchy across the site, rather than using foot candles and lux levels to dictate the design. Compositions were created that would guide the team through the design process from conception to completion. The entry and exit points were conceived as visual vortices, clearly organizing the overall space. Seen in the plan rendering, the vortices appear to be long glowing spaces that give a hierarchy to the mall. 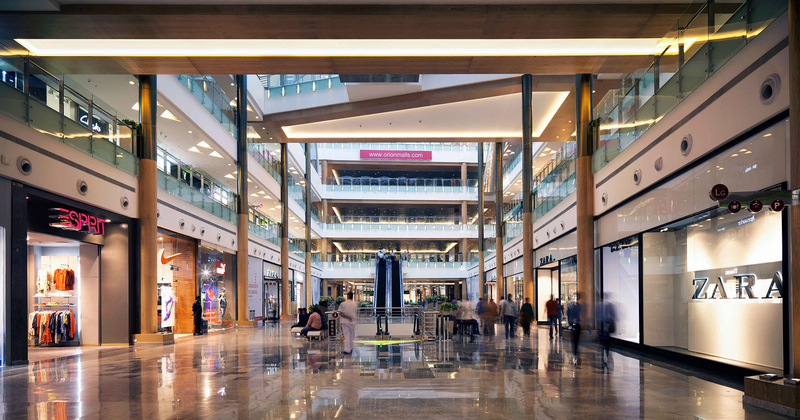 The Mall interior is unified by the pixelation of both the ceiling and the floor. 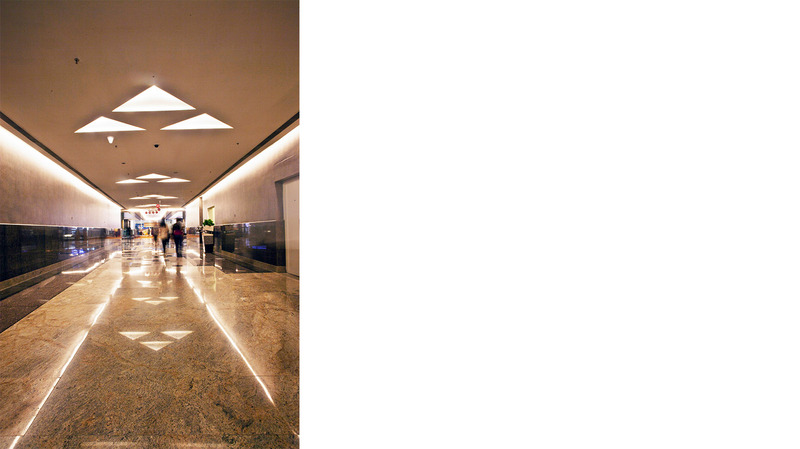 The triangular forms on the ceiling create a stitch of light for the circulation pathways around the atrium. The pixelation is further emphasized by the projection of an array of stars on the 10m wide Grand Staircase. 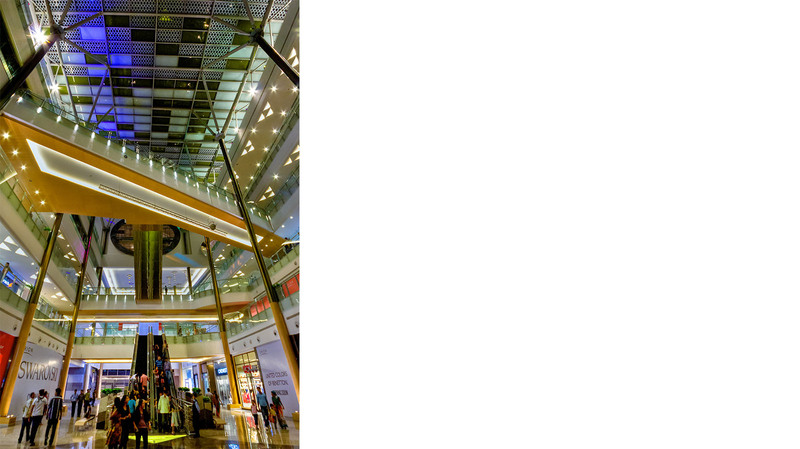 As many atrium ceilings on retail projects are often forgotten or neglected while designing the lighting for retail spaces, we were inspired by our previous projects such as Peak Tower in Hong Kong and sought to provide illumination to both the ceiling as well as the floor. A color-changing uplight illuminates the atrium ceiling from the column tops while a cool glowing cove light runs along the edge of the space. The fixtures designed for the complex integrate themselves within their context, taking influence from the architecture that was designed for the site. 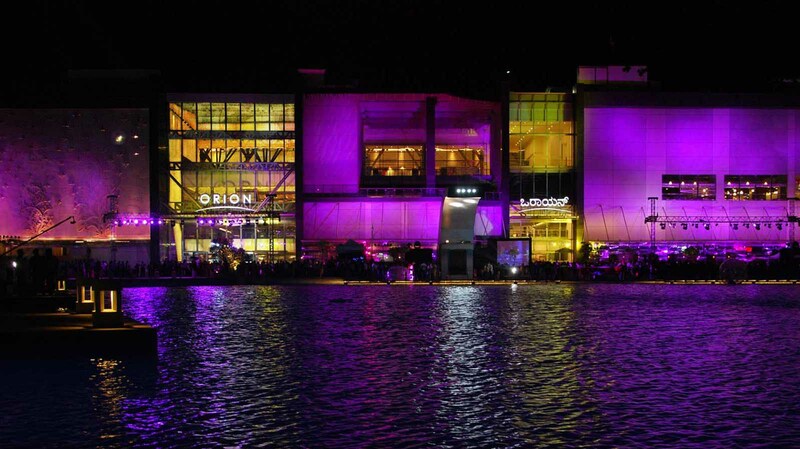 The streetlight design drew influence from the curved water features that are located along the lake. The custom bollard fixture was created by a local manufacturer and constructed from locally-sourced stone. 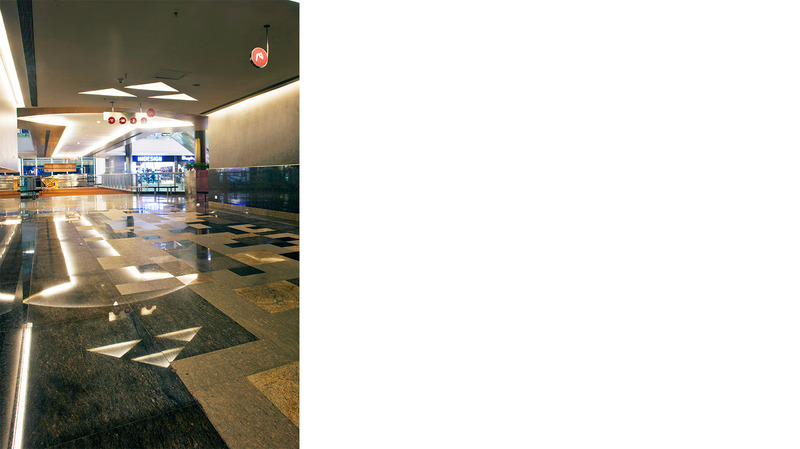 The use of bollard lighting allows the walkways to be lit without the use of any overhead lighting. The combination of the bollards and the tree uplighting creates a specific visual experience for the pedestrian. The Mall’s exterior features electronic and illuminated displays, which cover 5-story facades, as well as a glowing wall displaying a sculpture of “The Tree of Life.” Light from the façade provides a soft gradient of light over the pedestrian walkway, providing for the pedestrian traffic that will occur along the front of the mall. Skyway and walkway connections which link the Sheraton hotel, office facility, and residences at Brigade Gateway glow generously to reflect the intense flow of traffic within. The approach from outside the complex is enhanced by tall, illuminated sculptural elements and glowing beacons which lend to the exterior’s unique identity. 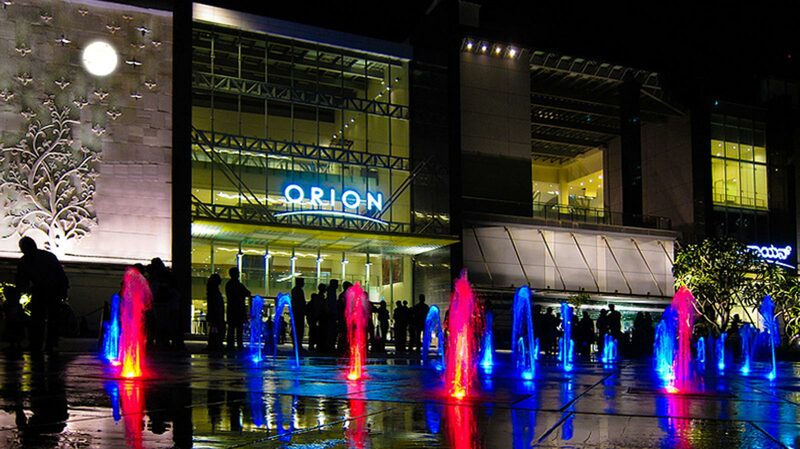 AWA implemented sculptural elements, (such as an illuminated “moon”), canopies and reversed arches, that work together to create the fun and beautiful lighting identity and to complete the Orion experience for the pedestrian. A 10m wide Grand Staircase rises from the ground floor to the plaza level above and is augmented by a projection of a dazzling array of stars, creating a pixelation effect throughout the space. 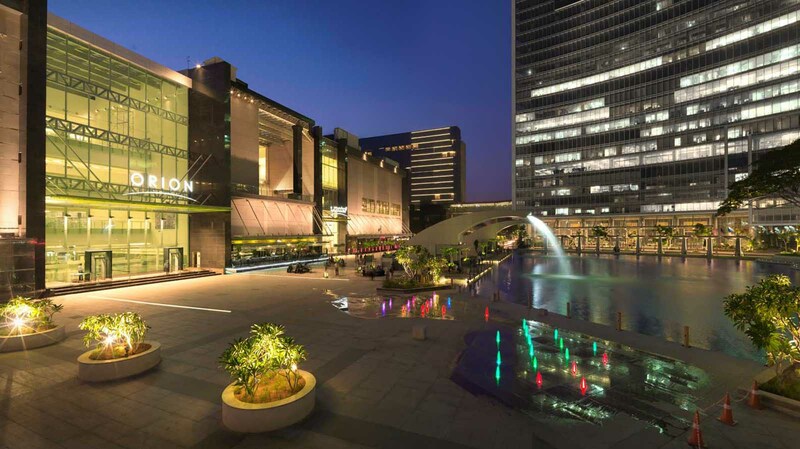 The Orion mall is also a hub for exciting entertainment, with spaces that include a multi-plex with 3,000 seats, a plaza level amphitheater with 1,000 seats, and a large event space on the ground level.